It’s been a wonderful couple days here at Hearst Castle for the invitational. The artists and staff of the castle have been great. I can’t wait to see everyone’s work framed for the show June 5. 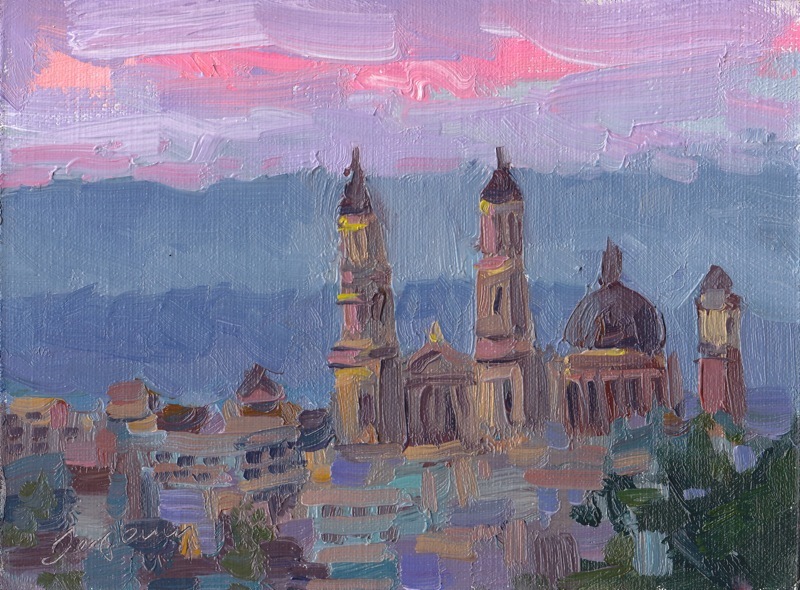 Tickets are available for $175 for the Friends of Hearst Castle’s “Twilight on the Terrace” fundraiser benefiting art programs for at risk youth. My first effort was painting “Casa del Mar”, a guest house on the South Terrace of the castle. I got to take a peak inside…wow. Opulent doesn’t begin to describe it. Hearst himself spent his final years in this house. This is just about done, I think a couple minor tweaks when I get back to my studio should do it. 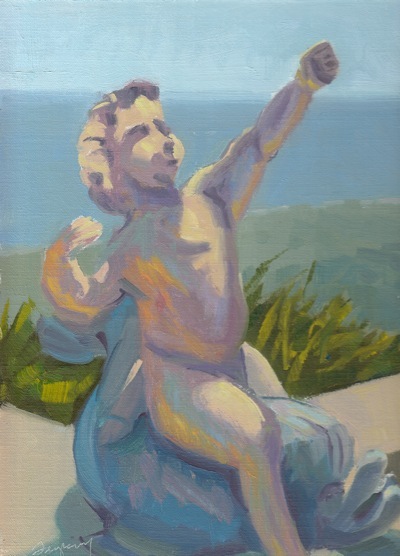 My next effort was painting this white marble statue, which I imagine is Cupid (sans arrow). 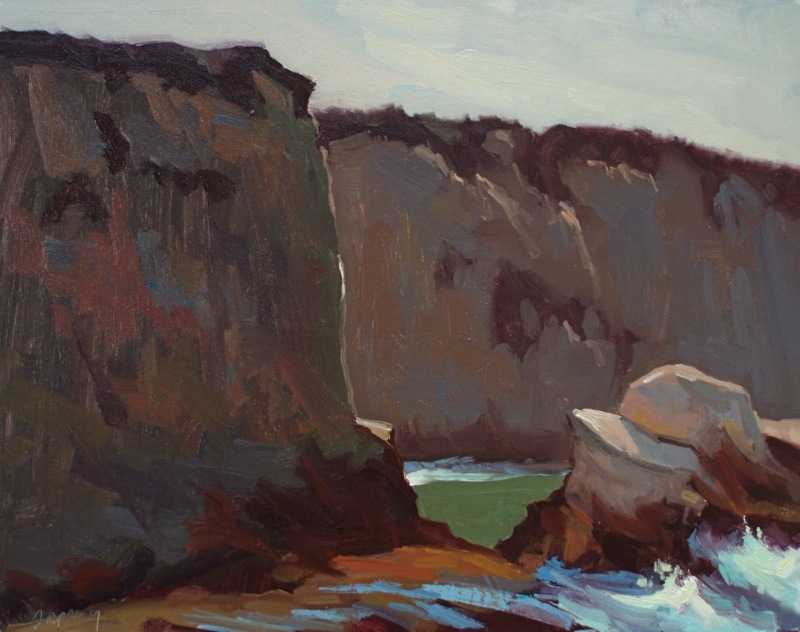 While in full sun is always a joy for me to paint, as white takes on so many colors and reflections of light. I’m not sure the color of reflect light is quite right, so I may make some adjustments before I call this one done. 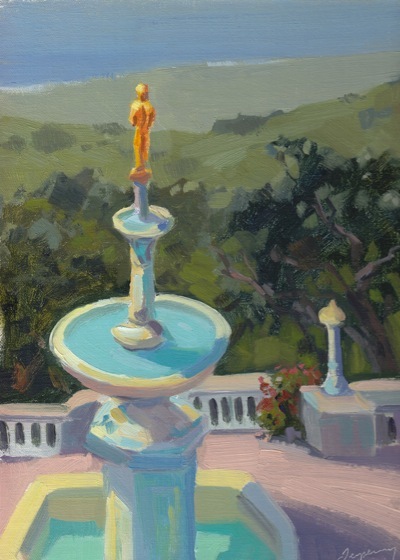 And on my final day, again on the South Terrace outside Casa del Mar, I painted this fountain and gold statue of a princess holding a frog. I realize the princess statue on top looks like an Oscar statuette, but that’s really what it looks like! Even the shadow side on the gold had a red glow. I’m happy with this one. 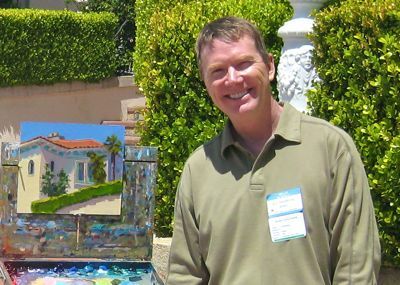 It’s interesting to me because it almost looks like two different painters/styles: the fountain is high-key, colorist, and the background trees and distant shore are more traditional value painting. As you can see, all of these paintings push color a bit. 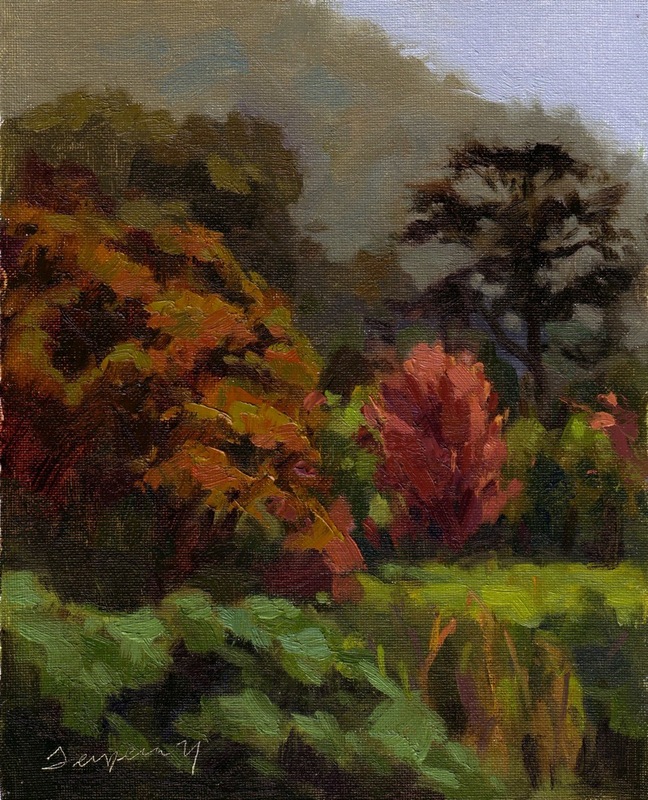 With full sun available, I didn’t paint much tonally. To make sure these colors are still on track, I look at the images in black & white as well. If light and shadow read well in black/white, it almost doesn’t matter what color you choose to paint (see my 2007 post on values). I think the light/shadow patterns read in this black/white versions, so these seem to be working. 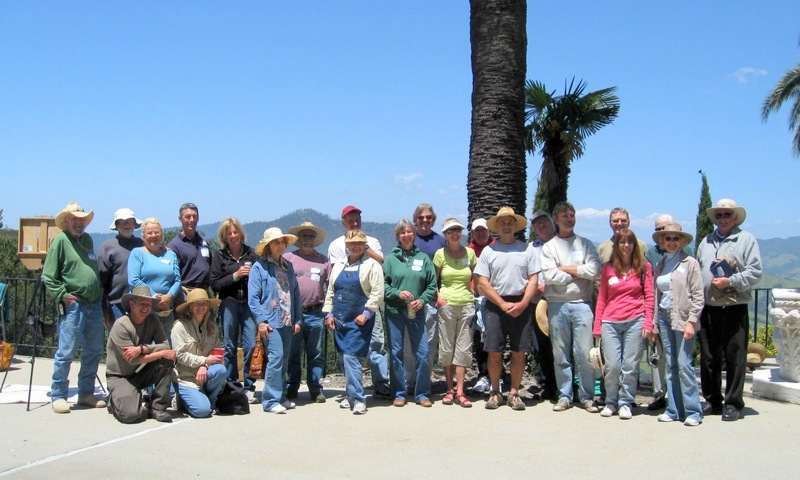 And here’s the group of painters. 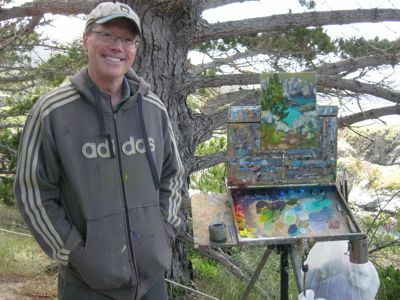 My trek to Hearst Castle has started in Point Lobos, where I got two good days of painting in. 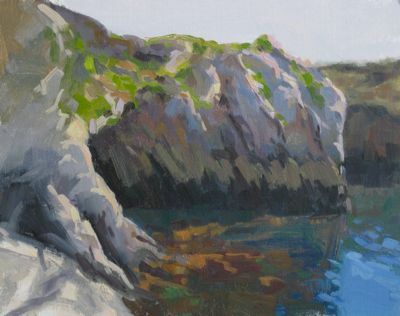 Point Lobos is located just south of Carmel, CA, where all men wear khaki (only), and there’s no one to give my spare change to (…coincidentally, the very first store you see on your way into town is called “Khaki”!). Lucky me, the fog only started to roll in as I finished my last painting! Tomorrow, I head for Big Sur for a couple days. 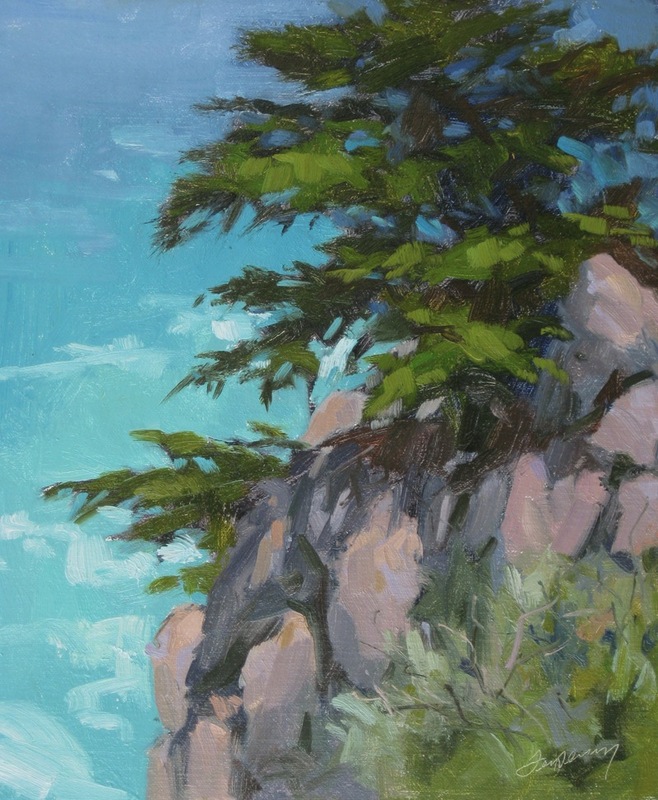 I ran into Carol Brightman Johnson, who is in town for next week’s Carmel Art Festival. Thanks, Carol, for taking this picture! Here’s my first effort. 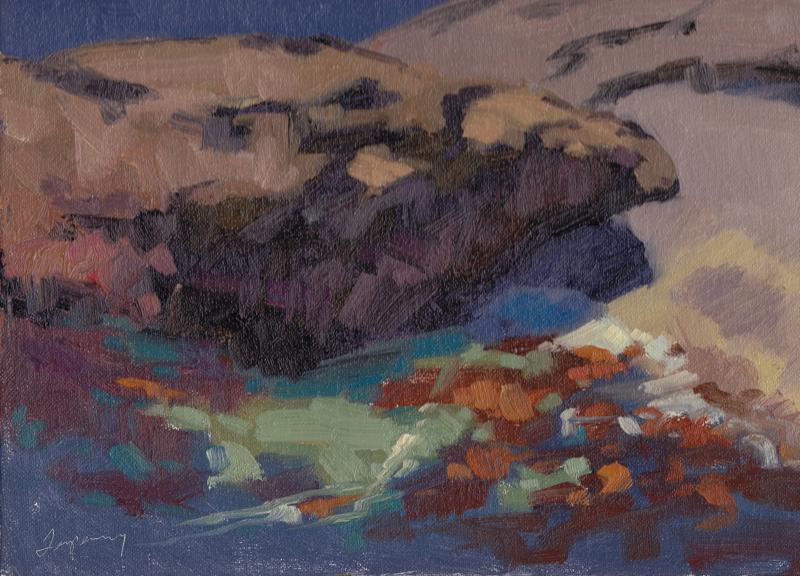 I obviously pushed the color quite a bit in this one, and in fact, so far all my work this week is going there. 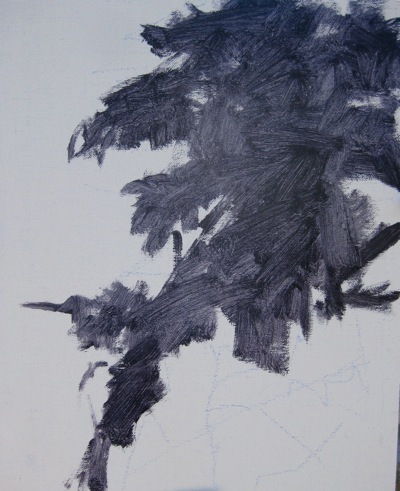 I need to be careful about this, because I feel the paintings risk loosing balance, and start to look trite. Tomorrow’s forecast is cloudy-rain, so maybe I’ll do a couple gray day studies to swing back to center a bit. This quick study is much simpler. 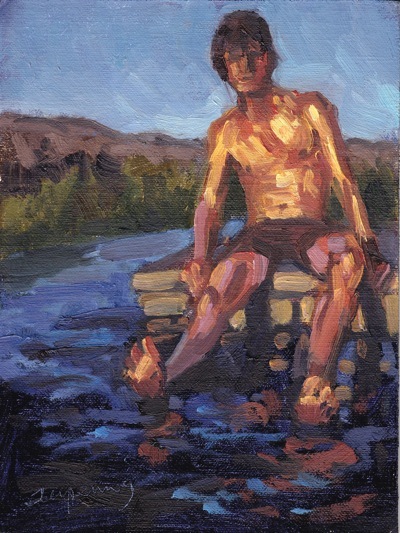 I focused on getting the color of the water right, which is pretty challenging here. Yes, I push color, but the turquoise green water in this painting is real. 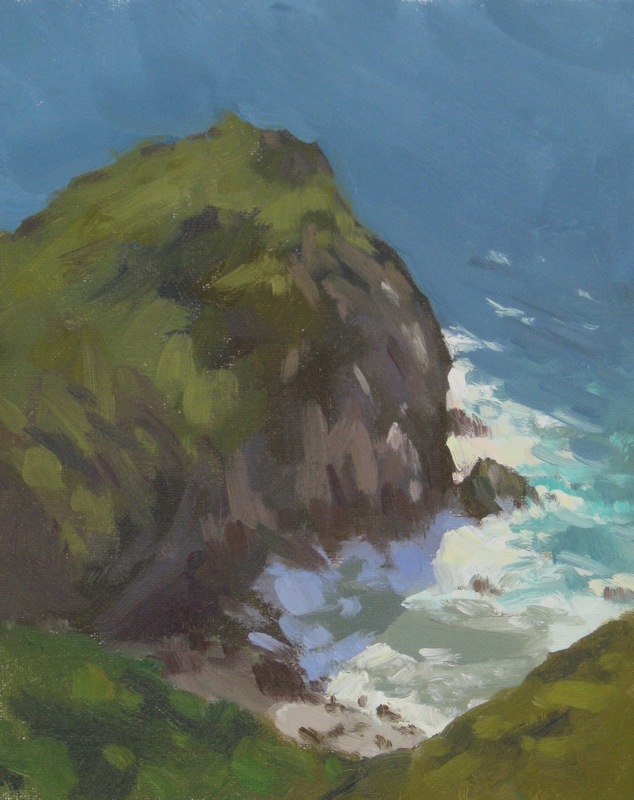 In fact, I so wanted that color to be the focal point, I started the painting from there, and worked my way outward. And finally, this is the last one of the day, and my personal favorite. The colors of white-ish bluffs in shadow are really fun to paint. Lots of warm/cool color and interesting shapes. The painting below reminds me of this one done at Montana del Oro for SLO a few years ago. 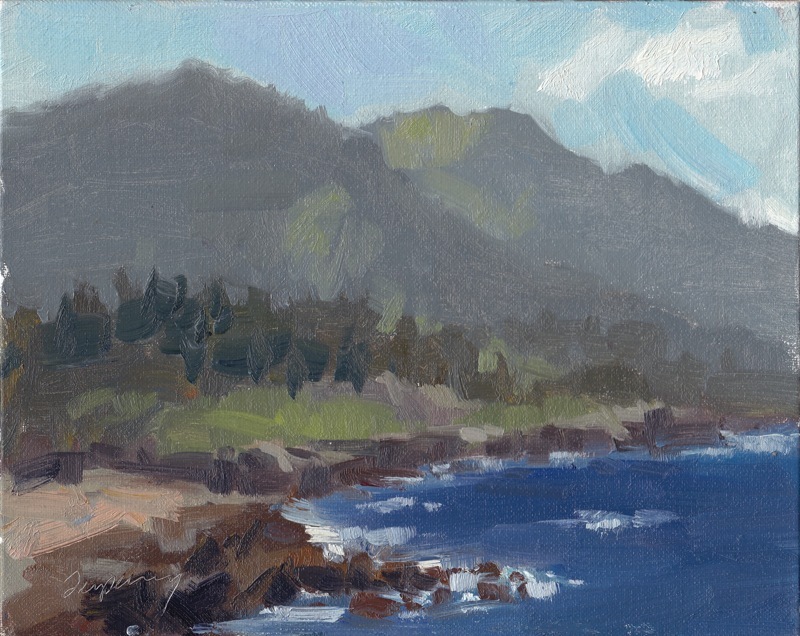 I am on my way tomorrow to Hearst Castle to paint for an invitational, and taking my time, driving down the coast from Carmel to Cambria with a stop in Big Sur a couple days. 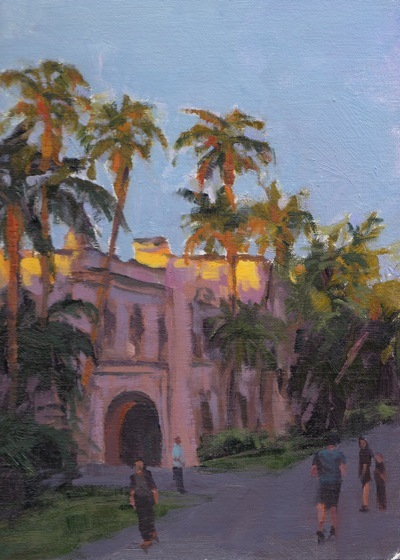 To prepare for painting the castle’s architecture, I got out some reference photos of Balboa Park in San Diego. I hope to post all week along the way, but my first priority is painting, so no promises! Balboa Park (Last Light), Oil on Linen, 12x9"
It was a beautiful, sunny day in San Francisco today — 73 degrees! I loaded up a small pochade kit on my bike, and headed down to Golden Gate Park. After riding around quite a bit, I saw this view looking south from Stow Lake. The challenge I set for myself was to both simplify the landscape, and represent clear color separation. 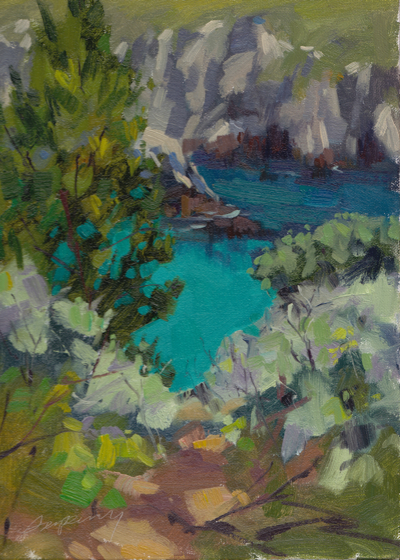 There are several types of greens in this painting. Enjoy! Not a lot of successful work this week. Calm before the storm. I head East next week for a nice art trip, so saving up the work. I do like this study. Enjoy. Saint Ignatius is a San Francisco landmark in the Western Addition. The school was founded in 1855, moved several times, and was destroyed in the 1906 earthquake. 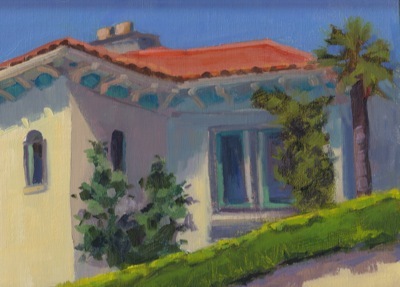 The building in this painting was built in 1914. Today, it’s the University of San Francisco. The building is well lit at night, and because it’s on a hill, is visible from many vantage points in the city. When I walk Gracie in Buena Vista Park across from the street from our home, this church is a glowing sentinel. 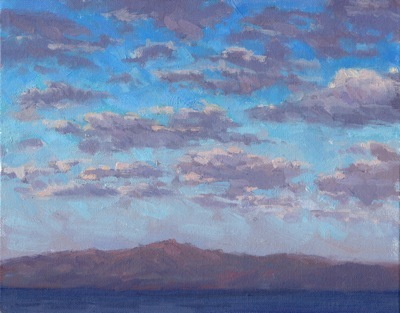 This view was painted from a photo taken between sunset and dusk. It’s at this time (before the lights come on) that the steeples just get a beautiful reflection from the setting sun. Enjoy! 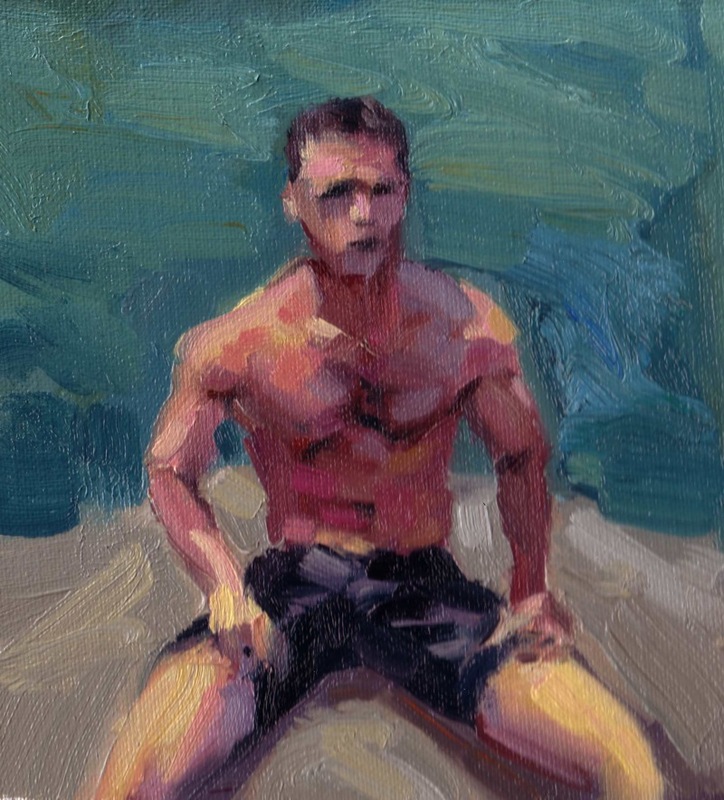 Here are few more recent figure studies. I continue to enjoy this new challenge–although I think I’ll sneak in a landscape soon. This figure (sans mouth!) 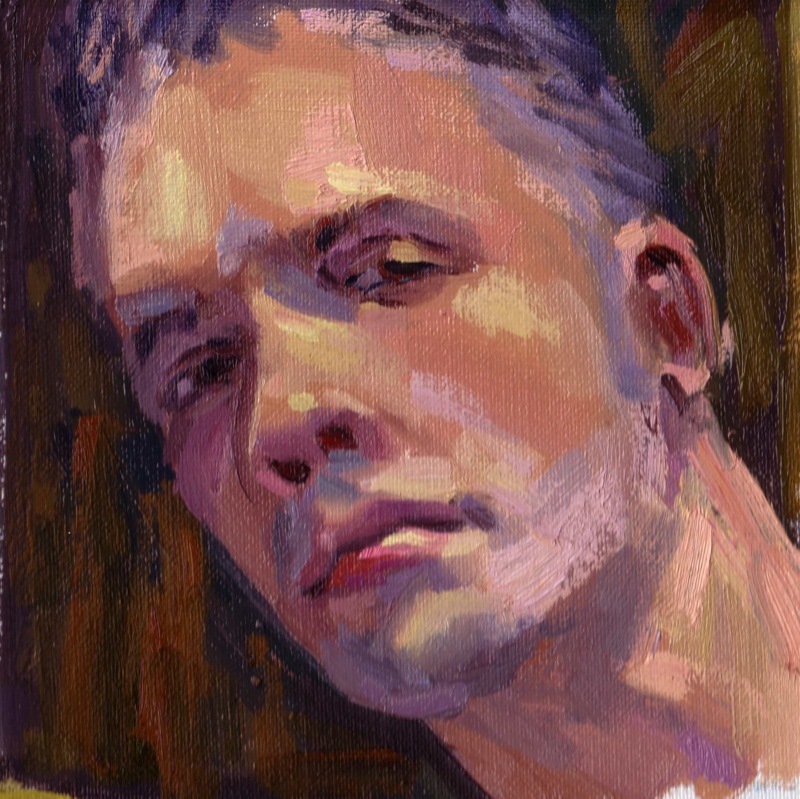 was done in about 10 minutes with a live model in Al Tofanelli’s class (at l’Atelier aux Couleurs). 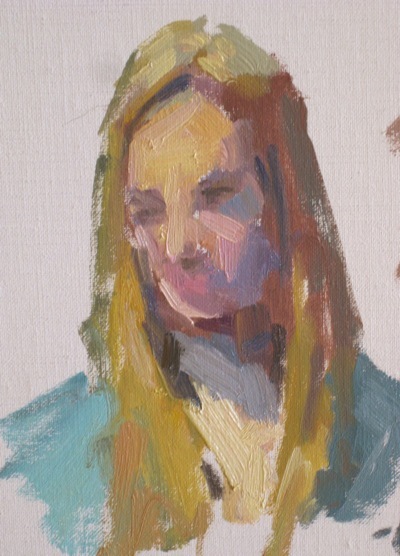 I like these quick studies–they force you to react quickly and focus on the fundamentals. I was actually quite distracted that day, but managed to get some work done (I was in the news last week as I represented Wells Fargo in social media, related to a PR fire. I’m now known as the “Male White Banker” on the Huffington Post 🙁 ). When I got back to the studio, I painted a couple more small quick ones (although, these are about an hour) from photos. 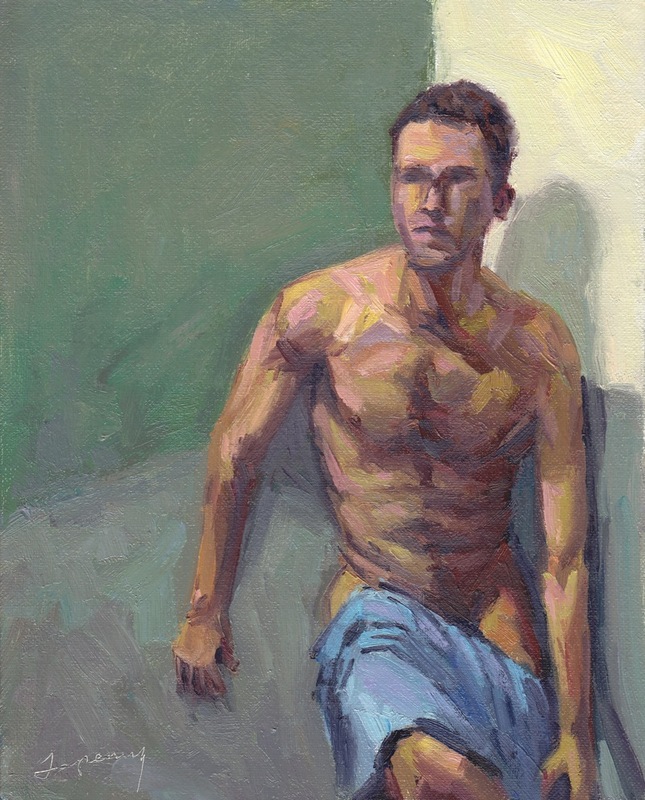 Figure Study (male), 6.25 x 6"
This one (and my previous self-portrait) reminded me that I should probably talk about my influences in figurative art. I’m seeking a sculptural quality, and trying to use color temperature and inventive color (although stable values) to create this new work. Figure Study, Oil on Linen, 6.25 x 6.50"
I count two of my biggest influence Lucian Freud and Ann Gale. Both are wonderful draftsman (clearly needed to paint the figure), but there’s something very modern and sculptural about their work. 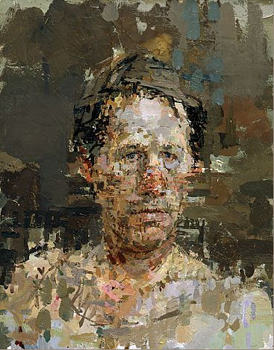 I look to these contemporary painters for inspiration. 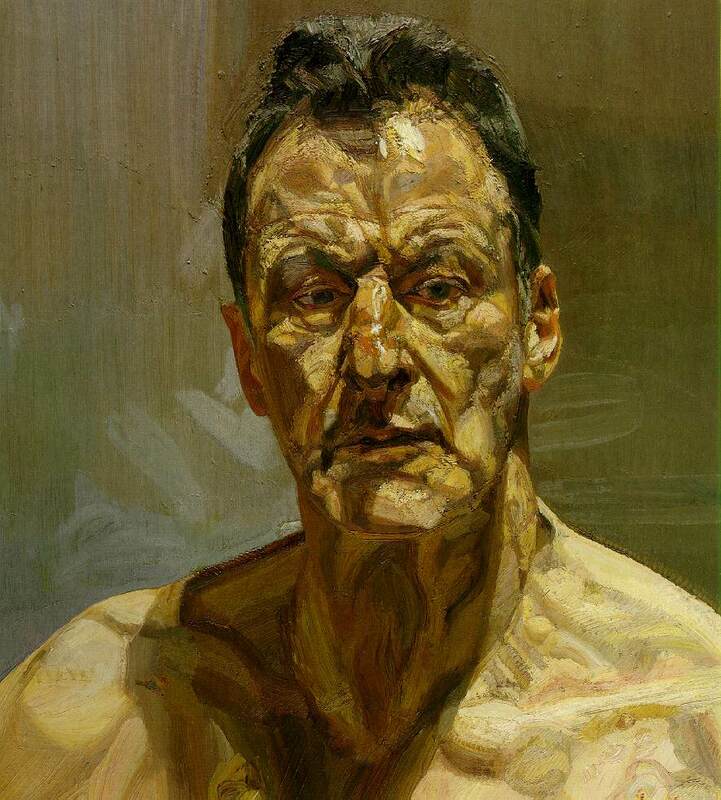 While this Lucian Freud work is terribly inventive in terms of color, it’s exaggeration of value and forum is something I really admire. 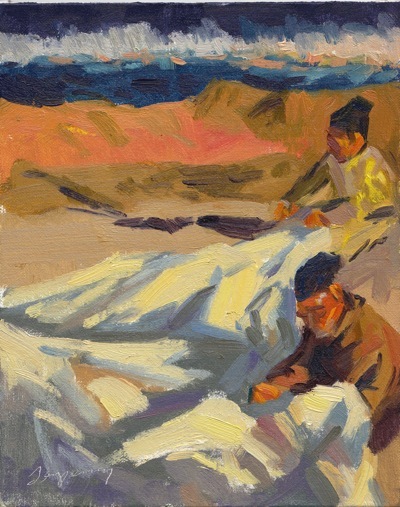 You can see in Ann Gale‘s work her form is somewhat distorted, although incredibly interesting. Look almost “pixelized”, doesn’t it? I really like her general restraint with color. When she does use it, it’s incredibly vibrant. You can see here how she sets up that vibrancy with a calm stage of neutrals grays. Ann Gale, "Gary with Dark Wall"
So, while I continue to slog through the basics (which for me, is drawing the figure accurately), this is the direction I’m headed. Hopefully, these influences will help guide me to my own path and vision.